Top-down shooters are ripe for resurrection in Nintendo's 3D Classics line: recent release 3D Classics Xevious did a decent job, and next it's Konami's turn with a version of classic arcade shooter Twinbee. The revamped game takes flight to Japan on 10th August for 600 Yen, the same price as Xevious. Interestingly the 3DS download will stay true to the original's aspect ratio: rather than stretching the screen or altering its screen size, the top screen is framed with virtual red velvet curtains for that extra touch of class. No word on when the game will reach the West but we'll keep you posted. I still love the Twinbee games and this first one should be pretty cool in 3D. Bring it on! Love TwinBee, but the sequal is far superior (and cheaper via. GameRoom for Xbox). But 3D really made xevious more interesting. So I will be getting this. Although Im not sure why nintendo are not offfering much varity on the 3D classics line. Lets see Racing, Shmup, Shmup... Wow. And both xevious and twinbee are already on DS with the repective arcade compilations launched years ago. TwinBee in 3D? Yes please! I'm sure we'll be getting it since we got the games on wii's virtual console. 3 words: take my money! I used to be freaking obsessed with this! 3D classics a failure? i think not! Xevious is killer! Twin... bee... whaaaaaaaaaaaaat?! Also... 3D curtains ftw! got the arcade version on Konami Classics Collection. Its pretty good. Id get a 3D Version. Bring it on. I'd rather have Pop n' Twinbee on the SNES. Eff yeah! The sequel might be superior in almost every way possible, but for me the NES edition has unbelievable amounts of nostalgia stored in it's ROM. I think I'll get this on release day. Not to be redundant or absent-minded, but what's Twinbee? Looks cool, but I'm not paying $9 for it. Awesome! I loved Detana Twinbee on Wii VC. Sure glad the next 3D classic wasn't Urban Champion. How bout we skip that one all together? Now if Konami would do 3D Graduis I'd be thrilled! I probably won't buy since I bought Xevious, but lol, those curtains look lame. The question is, Xevious or Twinbee? @WaveBoy - I'd say that it depends. Xevious has it's own, slower-paced style, while Twin Bee is a bit weird in design and considerably more intense. A matter of personal taste in my opinion, though I'll be getting both as soon as I can spend a bit of cash on the eShop. At first, I was like, "wuts twinbee?" Then I remembered something from VC... I'll b getting this. I'll only get this if its the only 3DSware that interests me and theres no sign of anything else on the service that interests me by the time eshop cards are available in Europe. Never played this, but will def download this. While i'd say the 3D makes a bit more sense in Xevious i'm definitely interested in this game. I think I will pick one if come out over here. Not that the series isn't a cool idea, but 2 shooters? Really? According to Nintendo there's only 2 3D Classics left, and I don't want the only ones worth buying to be shooters. 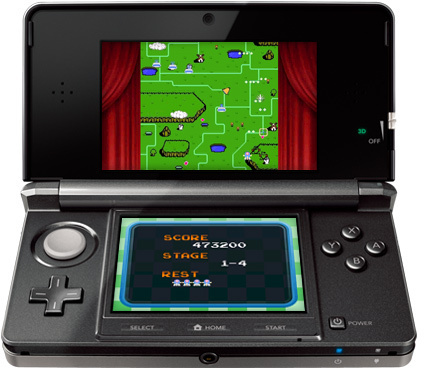 the 3ds screen is far better suited to horizontally scrolling shmups, which conviniently I prefer for some reason. Bring em on! @Birdman13 According to Nintendo, they were working on six at the time of the interview. There are likely more in development by now, or soon at least. Huh nice might check this out. Still not interested in Urban Champion though! I think we'll get it before Twinbee. LOL, my first thought was "What the hell is Twinbee? Nintendo can go fly a kite for all I care. I want more true classics, like Twinbee. I thought they were only gonna make 4 of these and that Zelda: Link to the Past was gonna be one? Wasn't that a rumor a while back? I like Xevious but, c'mon Nintendo, gimme a real game here. These are essentially 3D 8-bit iPhone apps. I'll probably be getting this one if it comes over here. I'm guessing it'll use the same 3D effect as Xevious, and unlike Xevious I don't own this game in several different forms. Looks a bit basic. Think I'll give that one a miss. Hmm never played this.I'll wait for the reviews. If there gonna be giving us lots of shooters though I would love - Soldier Blade , Thunderforce IV and Star Parodier please No curtains though thanks. Bit weird that! Never heard of this, hope it's fun. By the way, first comment! I don't know what Twinbee is but yaaaaay based on the responses here. Hell yeah!! Gradius 3D would be all kinds of awesome! Paradious 3D would be great too. I totally agree, the above 2 games and ones like R-Type would be better suited. There are lots of games that I'd like to see given the 3D treatment in the future (or any treatment for that matter), such as Strider, Rastan Saga, Castlevania, Contra, Bubble Bobble, Sonic, Ghosts N Goblins and Punch Out!. If the final two were Gradius and Punch Out! then I'd definitely buy them, but I think I'll pass on Urban Champion and Twinbee. I'd like to see 3D Classics: Zaxxon. Never played this game and don't understand the concept but I'll look out for it. LOL @ curtains. I passed on Xevious but I think I'll probably give this a download if it comes to the US. @ryanthehedgehog: It's pretty similar to Xevious. Flying around shooting things and dropping (well, throwing) bombs at things. The main differences are that there's powerups in the form of bells that you can collect and it's not nearly as monotonous as Xevious (if I'm not mistaken this game has an end unlike Xevious which just keeps looping). Was Twinbee a NES game? Because I thought only NES games would get the 3D treatment! Twinbee is a fantastic series I've been into for years with nintendo imports and stuff. It was a huge surprise in the 90s when I bought Stinger to discover that was Twinbee 2 with a bad rebranded name to it. Shame the fools of Konami took 20years to bring up the series again as the arcade release appeared in that DS package. @Henmii: It was an arcade game but it also had a Famicom port. This is probably going to be the arcade version though. Am I the only one who thinks that 'Tempest' would be a killer 3D classic?!?!?! Super Mario Bros. as a 3D Classic. well this looks fun, but i never expected twinbee. "It was an arcade game but it also had a Famicom port. This is probably going to be the arcade version though"
Ohh, going to put this on the list. Thats 4 places gone. 2 more chances for a good 3D-Classic :/ . The ones so far are ok, but thats it, and with only 6 ever being made they need to be better than that, and not sold for an insane price on top of that. Not worth it, especially since Xevious is already a 3D Classics title. Haven't played this before but it looks good. I'll be sure to buy it when it comes out. So far the only 3D Classic that it looks like I might not own is Urban Champion because that doesn't really seem good enough for the money I need to spend to buy it. Might end up getting it just to complete the collection though. Ive never heard of this game but just the name and that one screenshot make me eager to buy it. Im already contemplating getting Urban Champion despite its reputation. I haven't had a chanse to spend much time with it yet, but the risk vs reward of those bells are interessting. (Visually the Xevious transition to 3D was perhaps more impressive).